Damage spirits, of course we know these help with damage. 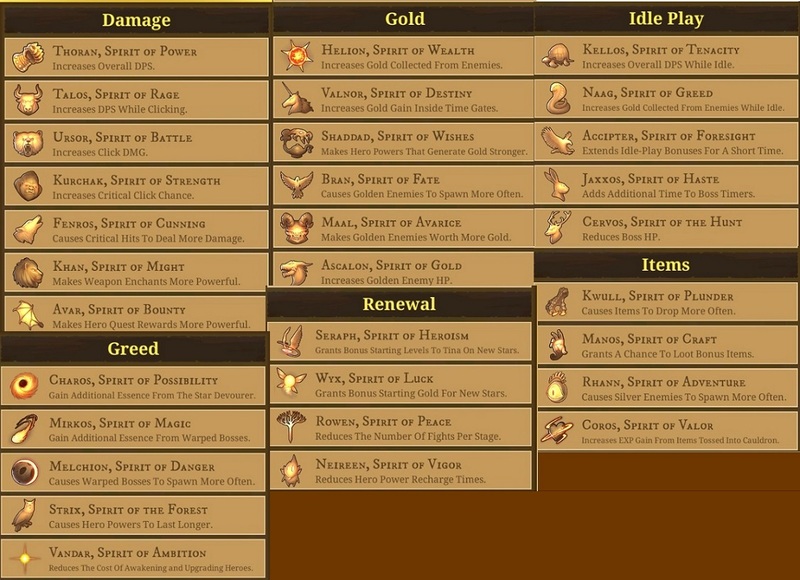 Read each one closely you have some that help with idle play, click damage and weapon enhancement. 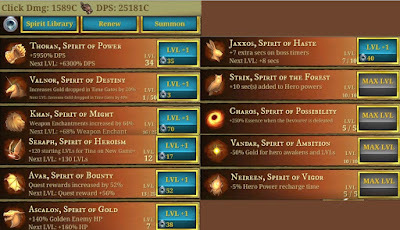 Gold and Items are easy these help you gain, items for spell crafting hero quests and weapon enchantments. Gold for leveling heroes. This also helps with new game sets. Idle play is when you're not clicking and the game is in idle mode. These allow you to gain gold and bonuses while in idle mode. Now let's move on to Greed and Renewal. Greed well any of these I can get, I'll summon Greed spirits give allow more essence to be gained, Heroes cost less to awaken and hero powers can last longer. Renewal basically is how you start each new sets. Neireen is one of my favorite, allows your heroes less time to renew after used. 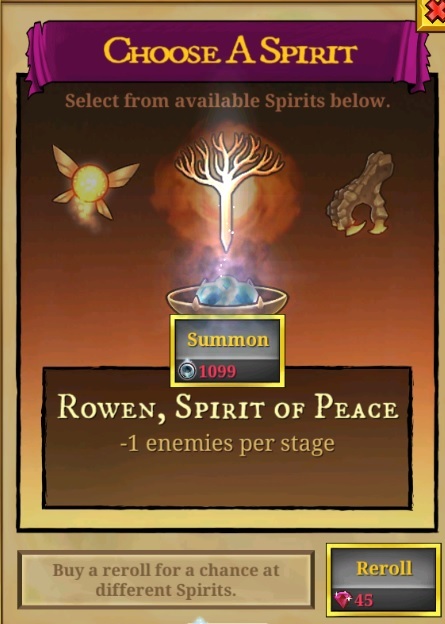 Choose your spirits wisely you can re-roll for gems if you do not like the set given or find one in that set and summon the spirit using essence. Spirits also level up! Don't forget to level your spirits some will max out as seen in image above, this is good your done leveling that spirit some can continue for a while. My Thoran is level 34. Hope this helps understand another part of the EverClicker game. Click on Heroes! What causes you to earn essence at the end of a world? I've noted various rewards from as low as 1 to as high as 24 essences earned from completing a world. The higher your Hero quest level, the more essence you will gain. 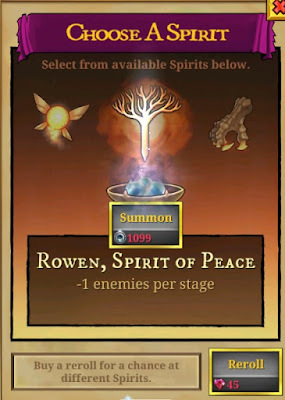 If you click on Hero quests You will see how much essence, right now mine grants 71 essence. Now factor in my Spirit level which is +40% and Billy Shears talent which also gives +% essence. End of world, you mean Devourers? I believe that depends on stage level. You can gain essences from other means as replied above. So you would gain 71 essence from the star devourer? No that depends on stage you're at. You can gain essences from other means as replied above. How many essence does Billy shears' power give?